A two-tailed butterfly sips nectar from a flower in the mountains of Tooele County. An anise swallowtail butterfly rests on a leaf in the mountains of Tooele County. Swallowtails are butterflies that belong to the family of Papilionidae, which contains up to 525 different species worldwide. They are formally known as papilio butterflies, but are nicknamed swallowtails due to their common forked-shaped hind wings, which is found with most of their species. This family of butterfly is uniquely known for its wing patterns, colorations, and variously large sizes, making swallowtails very alluring to the eye. This is why many people attempt to attract swallowtails to gardens, yards, and public places by planting specific nectar-providing plants for the adult swallowtails. 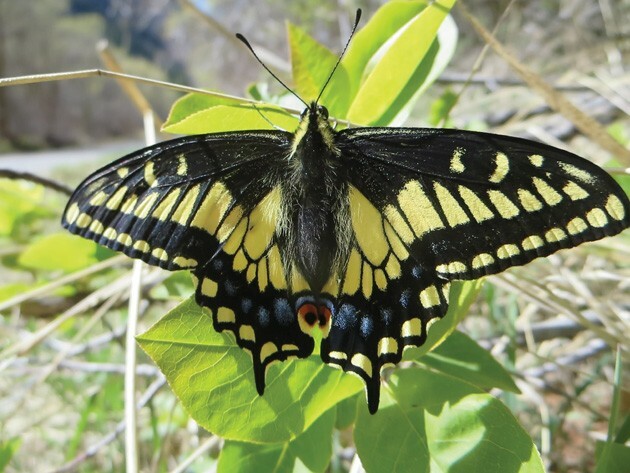 There are six species of swallowtails found throughout Tooele County. 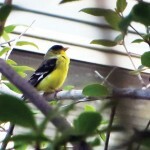 However, out of those six, two species are most commonly seen. These are known as the two-tailed swallowtail and the anise swallowtail. They are similar in many ways and both are great butterflies to attract into our neighborhoods. Most of the time, these butterflies can only be enjoyed up Middle Canyon and far up above Church Wood Road in the Pine Canyon area. Two-tailed swallowtails are bright yellow with black tiger striping, and possess red and orange markings toward the end of their hind wings. 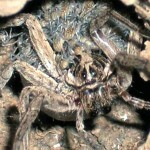 Their wingspan ranges from 3 1/2 to 5 inches wide, and can be seen in canyons, gardens, roadsides, valleys and woodlands. In fact, because of their size, two-tailed swallowtails are commonly mistaken for birds. The anise swallowtail’s size is smaller than the two-tail’s, but is still relatively big with a wingspan of 2 to 3 1/2 inches. Although size alone can be hard to differentiate from the two, another way anise swallowtails differ is their wing markings. On the tops of the anise’s wings, there is a prominent thick black stripe that the two-tail does not have. 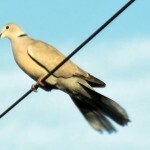 The anise also has only one pair of its tail-like parts on the lower-bottom of its hind wings. The anise can be found among roadsides, mountains, fields and gardens, while their caterpillar host plants include dill, fennel, parsley, and Queen Anne’s Lace. 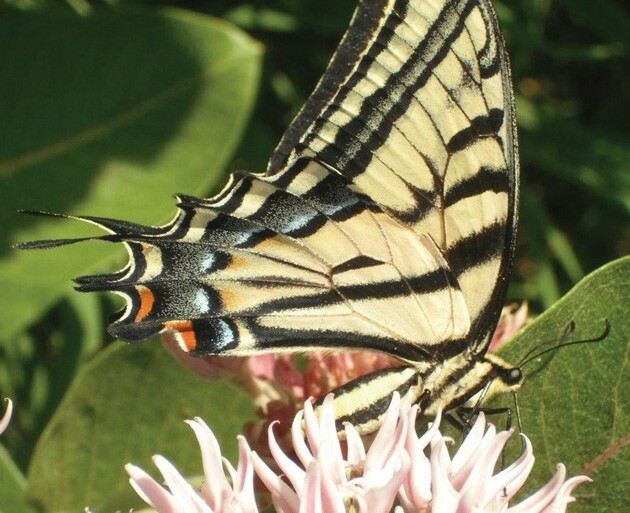 Many know that butterflies are attracted to milkweed, and swallowtails are too, but it is not always the kind of plant people want in their gardens or yards. However, there are a few good-looking flowers and herbs that they are attracted to, for example, two-tailed swallowtails will feed on lilacs, purple cone flowers, and butterfly bushes. As for anise swallowtails, they are attracted to zinnia, aster, and also butterfly bushes. 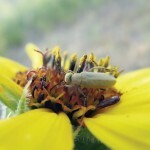 Taylor Lindsay is a writer and photographer of wildlife creatures big and small. She can be contacted at CritterChatter@live.com .